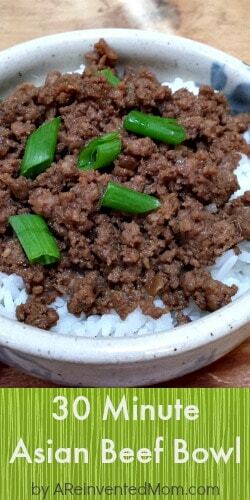 Made with ground beef, this 30 Minute Asian Beef Bowl Recipe is easy on your wallet. Most busy Moms have a few quick recipes in their back pockets for nights when everything seems to fall apart. Getting home late from work, taxiing kids around to activities and kids who want to eat NOW. You can relate to this, right? I’m sharing one of my favorite easy meals with you today – 30 Minute Asian Beef Bowl. From start to finish, this meal is on the table in less than 30 minutes, making it perfect for busy weeknights. Additionally, I can make this entire dish for $6-7, making it very easy on your wallet. 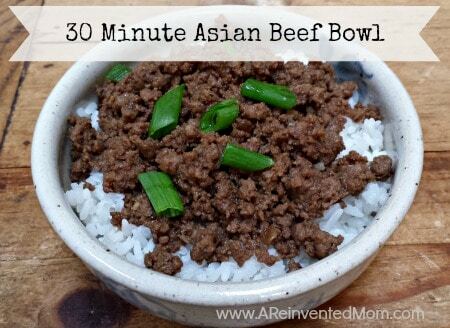 Thirty Minute Asian Beef Bowl is also a family favorite. Don’t you love it when an easy, inexpensive meal is enjoyed by everyone in the family? My meat loving Boy inhales this meal. Even The Girl (who is not a big fan of ground beef), likes this dish. The last time I made it, there wasn’t much left over. It’s time to start doubling the recipe to account for it’s popularity and larger teenage appetites. The ginger and sesame oil lend an Asian twist to simple ground beef. If you don’t have sesame oil in your pantry, you should be able to find it in the ethnic food aisle of most larger grocery stores. Buy the small bottle because a little goes a long way. I’ve had this dish in my recipe box for quite a while although I am unsure of it’s origin. 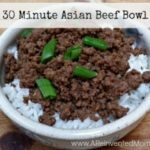 30 MINUTE ASIAN BEEF BOWL - Asian inspired flavors dress up plain ground beef in this quick dinner recipe. Combine ground beef and onions in a pan and cook over medium heat until meat is browned & cooked through. I use this handy tool to finely crumble the meat. Drain & remove grease from pan. While the ground beef and onions are cooking, make the sauce. Combine the sauce ingredients in a small bowl, and stir to combine. Add sauce mixture to the cooked ground beef and stir. Simmer over medium heat for about 5 minutes. Serve over hot cooked rice (use a rice cooker for perfect rice every time). Top with chopped green onion. I use 93/7 ground beef for this recipe. I've been using minced ginger in a tube with good results. Low sodium soy sauce is recommended. Love this recipe. Very simple and fast…this is my second time making it and it’s perfect. The only thing is I need to double the sauce my family are meat eaters so I didn’t compensate for the extra meat. I’m glad you (and you’re people) enjoyed this dish, Barbara. Thanks for stopping by! Great recipe! I added 1 &1/2 cups diced zucchini. The added veggie blended right in and didn’t make it feel healthier. Lol going to add more next time. Super easy and fast. Only took 20 minutes! 🙂 Ate it while watching some preseason football. Whole family loved including my kids. Only was 3-4 servings though not the 6 as recipe indicates. But its easily doubled. I’m so happy you & your family liked this dish, Stephanie. Great idea to add zucchini – it ups the nutritional value and also helps the budget by stretching the meat a little farther. As my son gets older and his appetite grows, I am realizing serving sizes are subjective. I think he could have eaten the entire dish by himself last time I made this.